Having a toddler or preschooler at home naturally means you are no stranger to messes. Still, there are some days when you just don't want to clean more play dough off the floor, or wipe yet more paint off the wall. These crafts and activities are just for those days! Most of these are easy to set up. 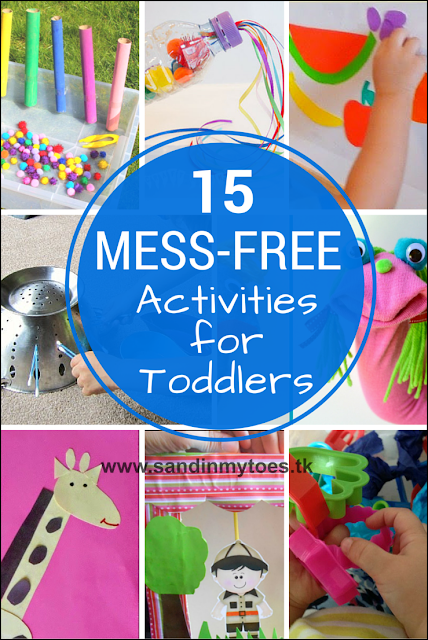 They won't leave a mess behind, and your kids will have fun too. It's a win-win. 1. Make a stick-on puzzle that your toddler will have fun putting together with our Fruit Sticky Puzzle* activity. 2. Something as simple as cotton buds can keep your little one occupied for a while! Check out this Cotton Bud Play* activity on Adventures Of Adam. 3. Our Snowman Texture Art is a fun way to explore textures while creating a winter craft. 4. This Pom Pom Drop* colour sorting game from The Imagination Tree won't take too long to make, but is bound to be popular! 5. Take an old cereal box and convert it into this Jungle Puppet Theatre* for hours of imaginative play. 6. Sensory bins don't always leave little messes. I love this idea for a Cookie Cutter Sensory Bin* from Crafts On Sea. 7. Use some Post-It Notes or just paper to set up this Number Hunt for a fun way to learn numbers. 8. These Button Sorting Cups from About Family Crafts are great for colour recognition, and a fun game too. 9. With only basic shapes, we made this Shape Giraffe*, a nice craft to do with only coloured paper. 10. It couldn't get easier than to set up this Cardboard Tube Game* with elastic bands, from Craftulate. 11. DIY Sock Puppets* are always popular with kids, and Taking Care of Monkey Business shares an easy tutorial. 12. Felt is another great material to play and learn with. Try making these Felt Flowers with your toddler, from Living Life And Learning. 13. Here's another simple play idea - using Balls and Bowls, from Munchkins And Moms. 14. Your toddler will love making these Rainbow Music Shakers* from Kids Craft Room. 15. Make these easy DIY Dominoes with popsicle sticks, from Pink Stripey Socks.